My Little Craft Things: Frilly and Funkie - Put a Ribbon on it! It's time for another wonderful challenge over at Frilly and Funkie! This time Linda is our lovely hostess and she has chosen the theme PUT A RIBBON ON IT. Don't forget to make to make is shabby chic or vintage style. One lucky winner will receive a $25 gift certificate to Linda's shop The Funkie Junkie Boutique! Here is my ribbon card. 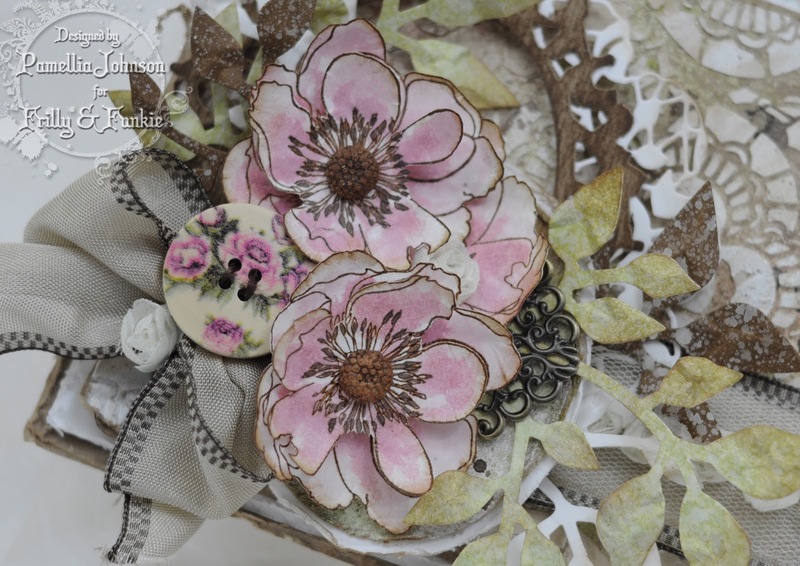 The flowers are from the new Tim Holtz Flower Garden set. I stamped them with Wendy Vecchi Archival ink Potting Soil and coated it with clear embossing powder. 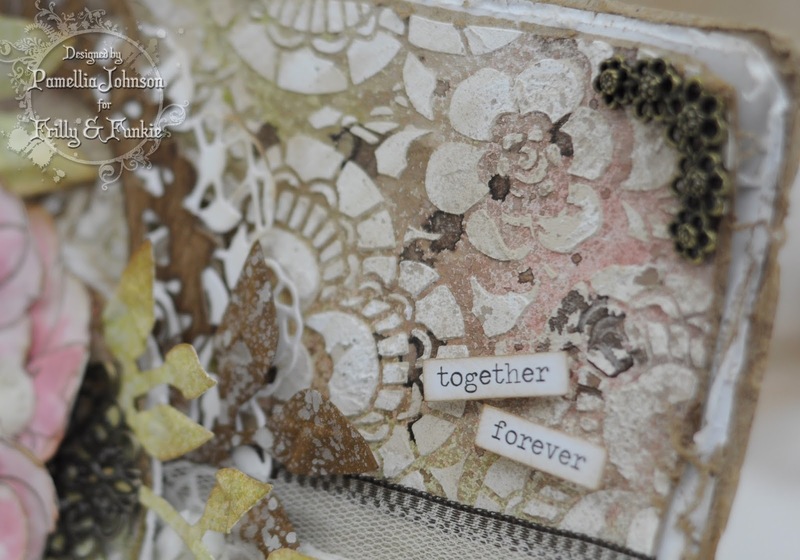 The centers are made using Vintage Photo embossing powder and Tim Holtz Gumdrops. 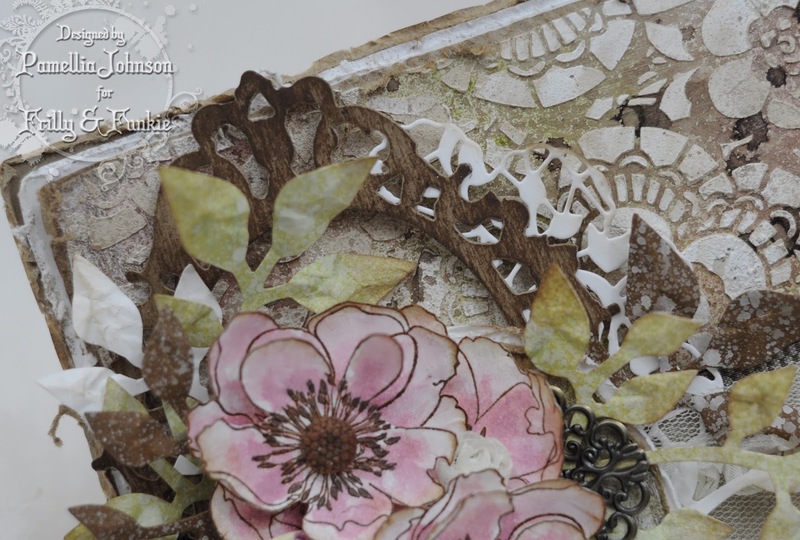 For the background I spritzed with Tim Holtz Shabby Shutters, Peeled Paint and Victorian Velvet distress sprays, then applied some Wendy Vecchi texture paste with the new Tim Holtz Lace stencil...my new favourite!! Then I spritzed with Lindy's Stamp Gang Moonshadow Mist Silhouette Silver. The frame is Tim Holtz Ornate Frame and I gave it a simple wood finish using some Gathered Twigs distress stain. The greenery is Garden Greens and coloured with Shabby Shutters and Gathered Twigs. The kraft sprigs were spritzed with Picket Fence. This is gorgeous Pamellia. Your background is so beautiful and I love all your pretty detailing especially the stunning flowers. What can one say other than yet another stunning piece of artwork Pamellia. Love the colours, composition, just everything about it. An AMAZING masterly card Pamellia.. I am in love with it! My oh my this is beautiful, more than just a card - it's art. Stunning creation Pamellia I love the colours also the amazing design and embellishments, stupendous make. Oh how beautiful Pamellia, loving all the flowers and what a beautiful button to compliment them. Pamellia, this is absolutely stunning! I love your dimensional fabulous flowers! The background stenciling is awesome! And the ribbon, woooow, it's so beautiful! Another gorgeous creation Pamellia, love the background and the flowers look stunning. Beautiful card, Pamellia! I love those flowers and the lace stencil. Oh my, your backgrounds are so totally wonderful, Pamellia. 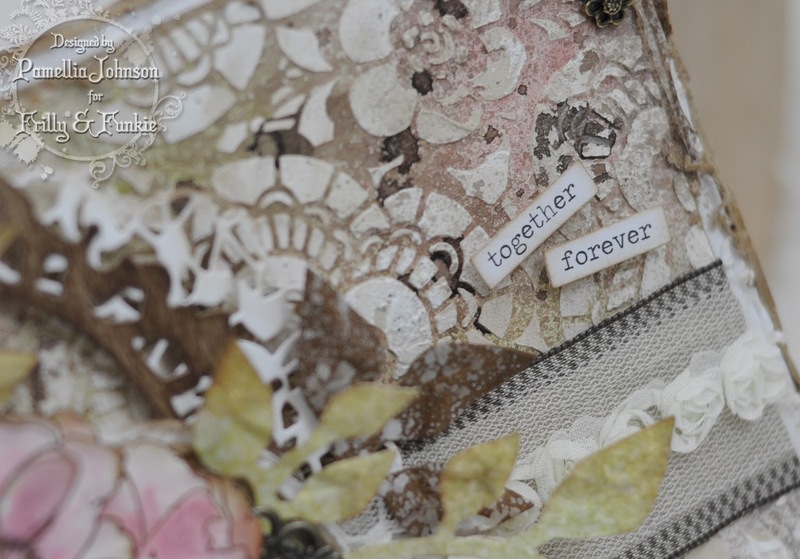 Love the way you always marry shabby with a touch of grungy! Your stenciling with that fabulous lace stencil is wonderful and I love the way you used the new TH Flower Garden stamps! Sensational piece of work here! Absolutely lovely once again ... beautiful layers and texture! Gorgeous card my friend! Love the metal embellishment that is peeking from underneath the flowers, such a great touch! So many pretty layers and textures! Your bow looks so perfect! Another stunner my dear! 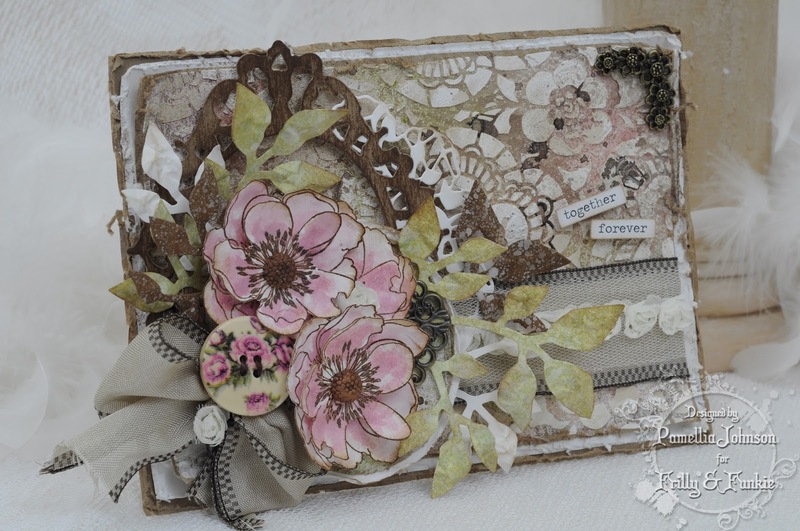 Wow another stunning creation loving all the detail and layers those flowers are gorgeous . Who would have thought of framing flowers, not me! I absolutely LOVE what you have done, yet again, I HAVE to be your biggest fan?? I just love love everything you do. Those flowers etc etc etc, are amazing! Another stunning creation Pamellia, such beautiful flowers, I love the way you have arranged them with the bow and frame - absolutely gorgeous. Stunning Pamellia, Love it all, so, so pretty. Congratulations on winning top 3 on Through the Craft Room Door. Beautiful work as ever Pamellia, love it! stunning. love how you made the flower garden stamp 3-d!! That is a fabulous creation that I scroll up and down to admire every inch every corner! The background is superb, the flowers are so amazing, the ribbon is a beauty and love the details. Absolutely fabulous Pamellia! Thank you so much for entering our ATG challenge at Through The Craft Room Door this fortnight. Looking forward to see you again next challenge. A gorgeous project, those flowers are gorgeous. Gorgeous card Pamellia, I like everything about it!! Wonderful vintage, shabby chic creation there Bubbles! (See, I am learning?). I do admire your use of well heck, everything that you used in this piece. Lol! Amazeballs! Hug Hugz muffin! Stunning card Pamellia ! You are the queen of shabby chic! Gorgeous card! I love the flowers and the ribbons, so many great details. Thanks so much for joining at Incy Wincy Designs this week. Holy cow...Pamellia this is Soooooo Lovely!!!! Your art peces are always so, so well made and look lovely. I love the beautiful shabby colours you used on this lovely piece. It's just another blessed day here in Wilmington, now that I've seen your lovely card! Love it all, and that ribbon/bow, those stamped flowers made to look like real roses and those tiny little fabric flowers all just make for one breathtaking scene! I don't know how you do it, but each time I see one of your creations I think to myself, how in the world can she top that; and you always do! But each one you make is as magnificent as the next! Bravo, my crafty friend! Hugs! Oh this is stunning Pamellia! I love the flowers and that fab button, gorgeous lace stencil too!! Beautiful colors and layering on this - love that wide ribbon! Well, you certainly put the chic into shabby! I think I will start a new style based on my own efforts in this genre and call it shabby shabby lol! Always a delight to see your latest creation as they never disappoint. Beautiful, Pamellia!!! So many pretty elements to look at here... to start with... your stenciled and misted background is gorgeous. I have that stencil, but haven't used it yet... now I must. Your flowers are truly amazing... love them adorning the Ornate Frame. All just so perfect!!!! Super gorgeous. Love the textured background and the very pretty stamped flowers. The colour palette works beautifully with the ribbon. 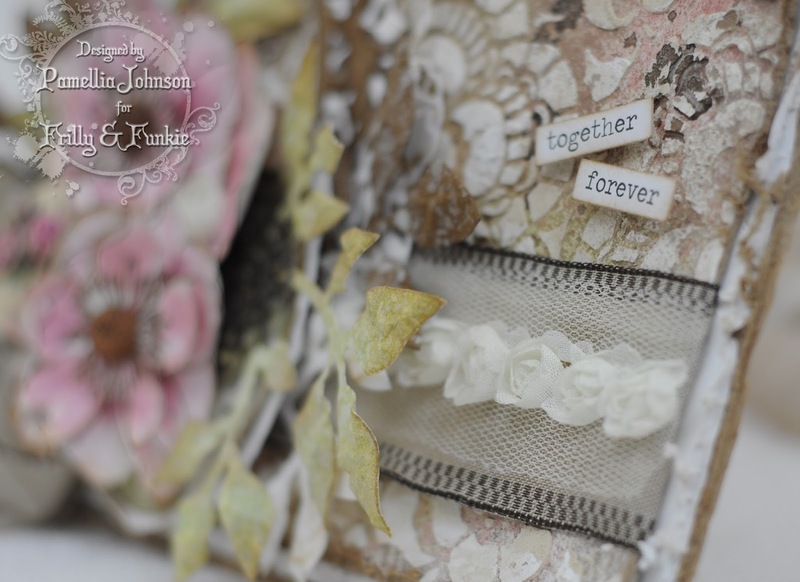 Gorgeous card, wonderful textures and flowers and I really like that ribbon!! Ahhhchhch! I am in LOVE with your layered perfection! You use die cuts better than anyone I know. Holy crap...this is awesome! If I were a bride to be, I'd walk down the aisle with this card. B E A - utiful!! Another fabulous creation Pamellia, the flowers are stunning, I love the stamen, such a great touch. Amazing textures too. Hello my sweet friend! :) I see you've been making more gorgeous shabby chic projects. This one is amazing. I've always admired your use of dies and stamps - you sure know how to make the best of them. Stunning card! 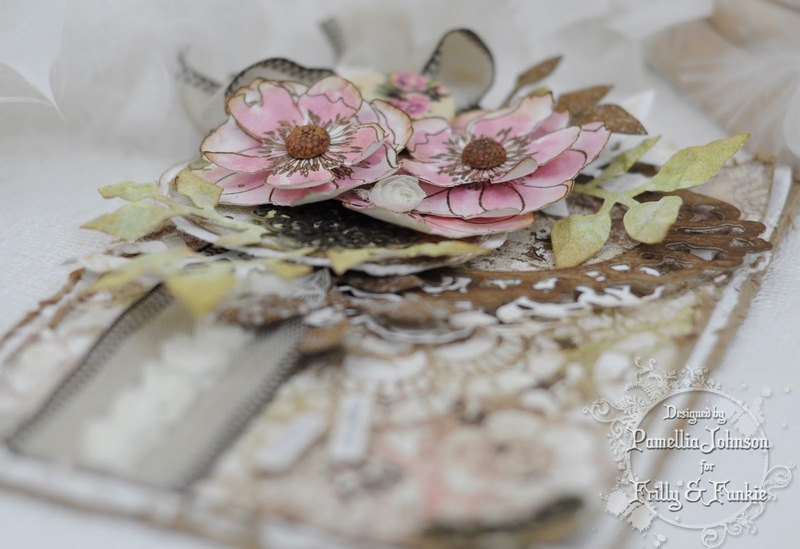 Gorgeous dimensional flower and stunning layers, Pamellia! Great way to use the gumdrops too! Your card is so amazingly beautiful. I love the flower centers and all the fab details. So elegant a very beautiful..gorgeous. Always love your very stunning creations, as there is so much beautiful work gone into them. The flowers are just so pretty! Love the frame and the leaves.. delightful! So gorgeous! Your layering is always so beautifully done, I love it!